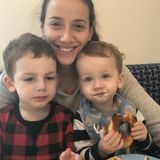 Looking for a part time mothers helper to take care of my two boys ages 2 and 4. After school care from 2 - 6 PM, 3- 5 days a week. Location is Leaside, Toronto. Responsibilities include playing with my sons during the day including arts and crafts and other activities, going to the park, light meal prep including after school snacks and dinner. Start date end of March.